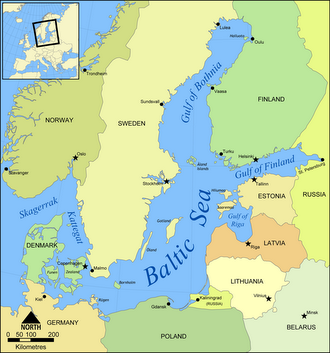 The is an arm of the Baltic Sea, which is bordered on the north by Finland, on the east by Russia and on the south by Estonia. 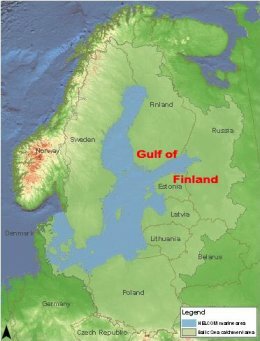 The surface area of the Gulf of Finland is approximately 30, 000 square kilometres, and the average depth of this shallow sea is a scant 38 metres. This saline water body is one of the oldest seas of Europe, being similarly inundated as long as three to four hundred million years ago. Source: Helsinki Commission The marine ecosystem of the Gulf of Finland has been degraded by invasion from a number of alien species and suffers from benthic anoxia; moreover, this shallow Gulf functions much like an estuary, being strongly influenced by the quantity of freshwater influx and by high primary productivity and seasonal algae blooms. The ecological imbalances have been exaggerated by heavy water pollution loading, especially in the Communist era of the USSR, which generated intense organic and heavy metal loads not only from Russia but the satellite Estonia. 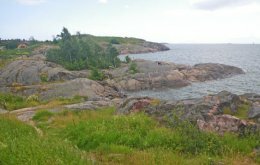 Human settlement of the shores of the Gulf of Finland is first evidenced about 10, 000 years before present, since glaciers covered the entire basin somewhat earlier. The early Middle Ages were punctuated with a viking culture based in coastal Finland, which carried out limited raids within the Baltic Sea area, not unlike their more noted counterparts originating in Norway, Denmark and Sweden. 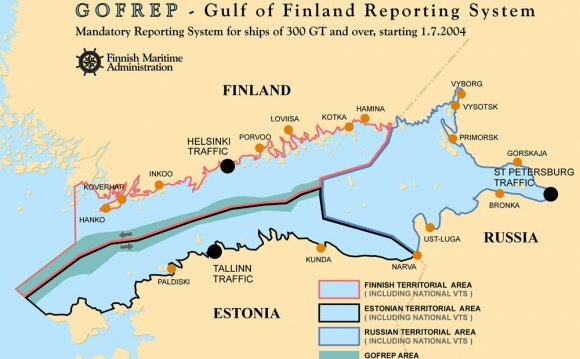 With land boundaries of Finland, Russia and Estonia on the north, east and south, the only marine limit of the Gulf of Finland is at the west. The western bound of the Gulf of is generally construed as a line extending from Spithamn Point (59°13'N), in Estonia, directly through the island of Osmussaar, thence to the southwestern extremum of Finland's Hangöudde Head. The basement of the Gulf of Finland is known as the Baltic Shield, a Precambrian northwest segment of the East European Craton; the Baltic Shield is comprises Europe's oldest rock formation, and it is chiefly composed of deformed Archean and Proterozoic gneisses and greenstone belts. The lithospheric thickness is approximately 200 to 300 kilometres. During the Pleistocene, massive continental ice sheets scoured and weighed down the Shield, leaving a thin covering of glacial material and innumerable lakes and streams. The Baltic Shield continues to experience post-glacial rebound, pursuant to glacial melt of the Quaternary. Subsequently the Baltic Shield underwent a major warping leaving the Finnish coast much higher than the gentle backshore of the Estonian side. Primary productivity in the Gulf of Finland is dominated by processes in the Neva Estuary and other waters of the western Gulf. These areas serve as a sink for phosphorus and source of nitrogen, thus governing algae production in the Gulf of Finland as a whole. The Gulf functions much like an estuary, with considerable freshwater influx and strong primary production, given that the entire Gulf is an Epipelagic zone. 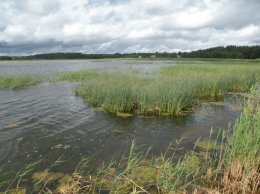 In the enclosed freshwater at Neva Bay there are extensive macrophyte beds dominated by Phragmites australis and Scirpus lacustris; these massive stretches of biomass may extend up to one half kilometre from the shore. Moreover, extensive mats of filamentous green algae form in Neva Estuary open waters in the summer; these mats are dominated by Cladophora glomerata, and these organisms wash ashore, spoiling beaches in much of the resort area of St.Petersberg. At the western edge of the north Estonian mainland, there is a circular current where the Baltic meets the Gulf of Finland; at this location there is very high productivity of two red algae species: Furcellaria lumbicalis and Coccotylus truncata; these algae are commercially harvested, the standing stock of the two species being approximately 120, 000 tonnes. There are about fifty fish species within the Gulf of Finland, including two endemic species common to the Baltic Sea and Gulf of Finalnd: Baltic cod and Baltic herring. The total fish assemblage within the Gulf includes a mixture of marine, migratory and even freshwater species. The two most abundant fish are Herring, Clupea harengus, and sprat, Sprattus sprattus. However, marine species are less evident in the eastern Gulf, which has strong freshwater influx and also in many coastal areas. Commercial fishing is carried out in spring and autumn; however, the cod fishery is exhausted due to overfishing throughout the entire Baltic Sea. Two pinnipeds, the Ringed seal and Grey seal can be observed hauling out on the shorelines. Alien species pose a significant threat to ecosystems, shipping and fisheries in the Gulf of Finland. Many of these introduced species have arrived in ship ballast water from other seas of the world. Particularly severe impacts have occurred in the Neva Estuary area including invasion by the Ponto-Caspian Zebra mussel, Dreissena polymorpha; the North American polychaete Marenzelleria viridis; the predatory Fishook spiny waterflea Cercopagis pengoi and the Chinese mitten crab Eriocheir sinensis. http://www.flyingcottoncandy.com/ nostalgia electrics cotton candy maker.